View of “Martial Raysse,” 2015. Photo: Fulvio Orsenigo. 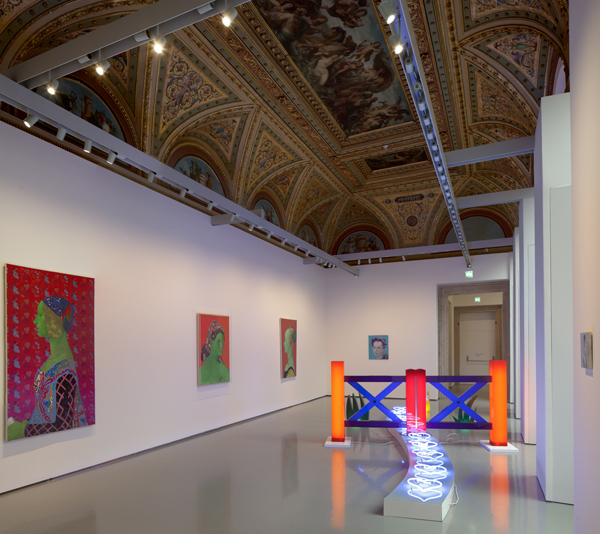 Following Martial Raysse’s recent retrospective at the Centre Pompidou, the first major monographic exhibition of his works outside of France since 1965 is currently installed at Venice’s Palazzo Grassi. Here the artist discusses his nearly sixty-year career and his visionary use of neon. The show is on view until November 30, 2015. WHEN GIORGIO DE CHIRICO was asked why his naked self-portrait from 1945 was his favorite painting, he answered, “Because it’s the best painted.” Ditto for my new paintings. In terms of progress, I feel that the paintings that I have submitted to the Palazzo Grassi are the most successful I have made. If I did not feel this way, I would not show them. I probably bring more depth and emotion now to my paintings, or at least I hope so. Above all, art is a story and a practice. It’s about being able to translate a deep human poetic emotion into volume and color. To work with different media is absolutely natural. I may have the desire to paint or to film or to cut wood, but the subject is of primary importance. It imposes the choice of the artwork’s components. Before, I used neon as something to go beyond color, but the use of neon in recent years in the world of art is too commercial. The public salivates in front of neon like Pavlov’s dog, and it has prevented me from using it in my work. My painting finds its expression in portraits, still lifes, and so on. I choose the same topics today because human feelings are always the same throughout history. It is a continuum. At every period of my life, I put all my resolve into producing accomplished works in the way that was mine in that time. I would not change my old paintings. I value them today as I do my own children. Success is obviously a payback for all these years of working without being understood, but my goal is not to be applauded. Rather, it’s to succeed in painting a good work of art. My fundamental, lifelong need is to put beauty in the world. It is amazing to live the adventure of exhibitions such as the Centre Pompidou and now the Palazzo Grassi, but I also have to understand that time is running out, and it is imperative to express myself before thinking about all other considerations. It takes me several years to paint a piece. Since 1999, I have known the dates of these two shows, and I have been able to plan very far in advance the distribution of work between the two exhibitions. My way of working is impossible to hurry, and just one thing matters: that the result is close to what I hoped to do. A great painting is ageless like clouds. Having said that, if you want to find your bearings, there are some milestones—schools of thought—that use of a lot of words ending with ‘’ism.’’ I have no regard for labels because, for me, modern and contemporary art that we know, that is being taught nowadays, is not the true history of art. It is only the story told by the art dealer.